Near the center of colonial Old Havana and the Havana’s Amphitheater a chance meeting happens, when the restaurant Café de los Artistas suddenly appears. This is a unique and peculiar restaurant located just in the corner of the popular “Callejón de los Peluqueros”, few steps away from the Palacio de la Artesania and the Hotel San Miguel. 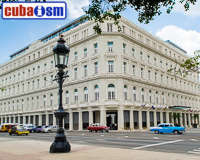 Just few blocks away from Capitolio, in the humble and yet beautiful neighbourhood of Old Havana, lies a small quaint place, adorned with the elegant decor of an old gentleman’s establishment. When we are looking for place to eat, we are not just looking for excellence on the food or the drinks, we want to find a place where we can feel comfortable, relaxed and have a good time among friends or family. ...a pretty place to take a break. Private restaurant very near to the castles of El Morro and La Cabana. This paladar offers quality dishes like octopus in garlic and the typical roast pork in a wood oven. This snack bar, which is, perhaps the most attractive place in the Hotel Telegrafo, mixed two styles, vintage (original) and modern one in a creative way. With an excellent view of the Paseo Promenade coupled with a homely and relaxed atmosphere, the Doña Blanquita is one of the best located private restaurants in Old Havana. The Sloppy Joe's, one of the most famous bars of Havana and shelter of tourists, baseball players and movie stars, reopened its doors in 2013, almost 50 years after closure. Located in the Hostal Valencia, La Paella is a relatively small restaurant with a nice decor and a charming atmosphere. Nestled within walking distance of the Havana's Central Railway Station, Puerto de Sagua Bar & Restaurant invites you to enjoy its exquisite seafood dishes, continuing the tradition of this restaurant founded in 1945. Europe is located in one of the most important streets of Old Havana, Obispo. RESTAURANT OUT OF SERVICE: CLOSED. Located in Old Havana, this place offers amazing cuban food at very reasonable prices. Just go and you will not be disaapointed! Excellent service and food in a very small and cozy restaurant located in the bowels of Old Havana. Fantastic cocktails and atmosphere. Los Mercaderes restaurant, combines the ambiance of a typical colonial house with a wide variety of dishes ranging from the traditional Cuban cuisine to the international with a special emphasis on fresh seafood. To Share a Drink with the City: Azúcar Lounge & Bar. A spectacular location with a view to Old Havana Square and a long list of cocktails is the main attraction of this tapas bar. Nice atmosphere and friendly, high quality service.